(1) Solid-state NMR: Engineering of advanced NMR techniques encompassing both spins-1/2 and half-integer quadrupolar spins--most methods utilize various aspects of dipolar couplings (homo- as well as heteronuclear) to establish site proximities/connectivities and to estimate inter-nuclear distances and molecular geometries; development of efficient numerical protocols for simulating NMR experiments; applications of solid state NMR to structural studies of crystalline and amorphous inorganic materials, including ceramics, porous materials, glasses, and cements. 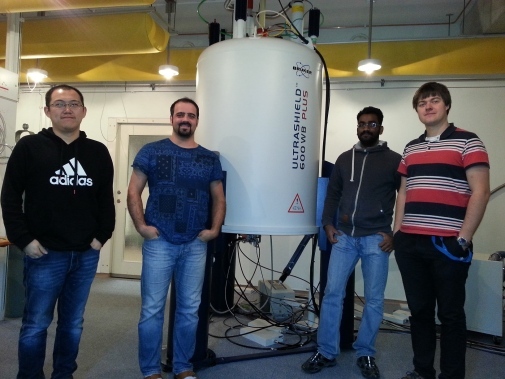 This group is consisting at the moment of 1 PhD-student (Hua Guo), 1 postdoc (Wei-Chih Liao) and 2 researchers (Yang Yu; Baltzar Stevenson). If you are interested in doing postdoctoral work in my group, please contact me! Please note: a sound background in MAS NMR is required.